Super budget friendly in price, Château Abbaye de Saint-Ferme Bordeaux Supérieur 2006 had an idyllic description of how the grapes are sourced from vines grown farthest away from the 14th century abbey located on the property, resulting in them being tended to in the evening, hence the title running along the bottom of the label, “Les Vignes du Soir”. The abbey is now home to the vineyard’s owner Arnaud de Raignac and his family. His family has been making wine for 500 years in the very same region. His focus is to honor tradition, but also to produce “affordable, well-structured, mouth filling, elegantly rich wines”. 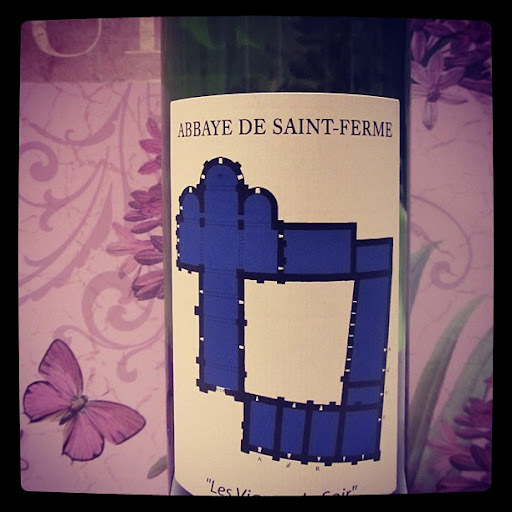 The rather non-traditionally Bordeaux label is a modern representation of the 14thcentury architectural floor plan of the abbey. Brick-garnet in colour, after aerating aromas of ripe berries and violets swirled about in my glass. Juicy blackberry and soft cherry flavours dominated the medium body, whilst traces of fresh, minty herbs and a bit of acidity added a bright element. Cinnamon and white pepper intermingled with soft oak notes in the moderate finish. Light, yet fruity and spicy, this is an easy drinking glass that is fantastically friendly on the wallet. I just love good, cheap, French wine!